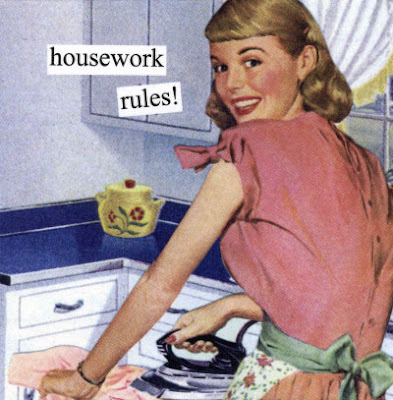 As you may have noticed by my absence, I've been taking a short break from blogland this week to de-clutter my house! Normal people usually have a "crap drawer" or something like that. The place where all of the random crap goes when you don't have a place to put it. Well, I have a crap drawer, 3 crap cabinets and more crap boxes than I can mention! So, I'm de-crapping this week and so far, so good!! Yesterday, I purged my china hutch and foyer closet of all of the crap and found a home for it or ditched it. I'm pretty proud of myself. I've been the anti-fashionista this week in my capri pants and Pj's t-shirts so I can really get serious. Today, I'm will conquer Mount Laundry in the basement. Wish me luck! While I clean and organize, I've been brainstorming lots of lovely post ideas and fun things for Va-Voom Vintage so hopefully I'll get some time to sit and type it all out! I have a giveaway coming up in early September, which I'm VERY excited about so stay tuned for that, my dears! Inspiring...I should have decrapped before I went back to work! What a great word - decrapping! May I borrow it? BillHubby and I are both amazed at all the Stuff we have and how it multiplies!!! Have fun with your decrapping! When you have time I know we'd all love to see "first steps" pictures!!!!! I badly need to decrap too, I'm just rubbish at throwing things out. I do the thing of, oh this'll come in useful at some point, I'll keep it. I need to be ruthless like you! LOL, I'm probably not the first person to use "decrapping" but you may use it all you like! I read in a 1950's book on housekeeping that you should clean out drawers, closets, etc when you're really angry! It works! Next time you're really pissed off, haul off and demolish a pile of junk. You're already mad and feeling like you want to destroy something so you probably won't keep useless junk. It feels really good to accomplish something and I like it because I take my aggression out on my messy house. I need to do this! I cleaned out one of my drawers in my kitchen on Saturday and I realized that I have more places that need "de-crapping!" I found so many mystery screws and washers along with take out chop sticks and soy sauce packets. Good luck with the decrap project and congrats on your daughter's walking milestone! How exciting! Good luck with all the decrapping & have heaps of fun on the weekend. A big congrats on Olivia's 1st steps,that's so exciting when it finally happens.She is such a darling & i luv her name as well. Good for you! Best to do it now because before you know it Olivia is going to be getting into any drawer she can reach. Half the drawers in my apartment are empty because Simon just gets into everything! We did a major decrapping the first time we moved cross country, and it still feels like I should do more, but I have "I might need this someday" syndrome! ooh how i love to de-crap :) haha this is a cute post. thanks for joining the group on ifb! i followed your blog. i love vintage!! i really would like to hear more about your finds and such. stay in touch! i hope you can visit my blog and follow, i think you'll like it!